SKF NOTE: Thank you, Doug Ramsey, for this wonderful piece on a true missionary of American music. Willis Conover spread American culture and values across Europe and the U.S.S.R. with his radio program, but almost no one in the U.S. knew about his show. During the Cold War, listeners in captive nations behind the Iron Curtain huddled around radios in basements and attics listening to the imposing bass-baritone voice of the man who sent them American music. For 40 years, until shortly before his death in 1996, Conover’s shortwave broadcasts on the Voice of America constituted one of his country’s most effective instruments of cultural diplomacy. 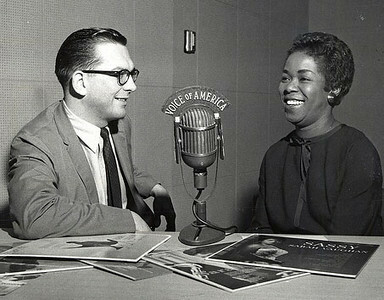 With knowledge, taste, dignity and no tinge of politics, he introduced his listeners to jazz and American popular music. Countless musicians from former Iron Curtain countries have credited Conover with attracting them to jazz…. This entry was posted in Drum/Music News and tagged Doug Ramsey, Drummer, Scott K Fish, Voice of America, Willis Conover. Bookmark the permalink.